Apologies for the fact this dreadful website looks like something I constructed on one of those BBC computers in the 80's. I'll be honest, I'm no tech whizz! Someday, someone out there will do me a one that sings and smells but for now... read this, written in my best Times New Roman. 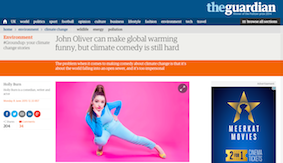 HOLLY WROTE THIS ARTICLE FOR THE GUARDIAN ON CLIMATE CHANGE! '50 Funniest Moments of 2014' here on 4od. Holly recently appeared in the new ITV2 comedy series. Holly is a stand up and character comedian, she is also an actor and clown, trained under Philippe Gaulier. Endlessly inventive, relentlessly uncompromising and totally unforgettable, this hotly-tipped, silly and exciting renegade breaks all the rules. 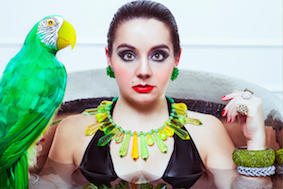 "THE ONE TO WATCH 2013"
"Vivacious character comedian Holly Burn's mixture of the madcap, the surreal and the downright deranged has become more and more beguiling over the past few years. Harry Hill recently joined an ever-growing number of people enthusing about this kooky Geordie lass." 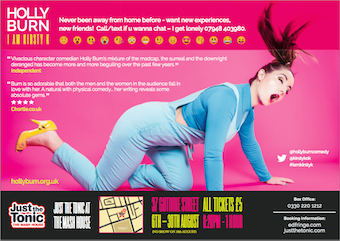 "Ms Burn is a charismatic performer and one who certainly puts her all into her performance... Hilarious. 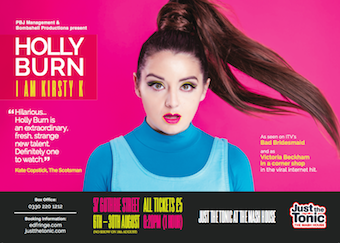 Part vamp, part clown, part psycho and part hostess with the moistest... Holly Burn is an extraordinary, fresh, strange new talent. Definitely one to watch." "The extravagantly odd Holly Burn is a some-time sketch performer, some-time character comedian, but in truth her refreshingly peculiar material defies easy categorisation. Burn's comedy mixes grand flights of artistic fancy with the basest kind of silliness, and is all the better for it. Daft wordplay, clowning, mime, surreal whimsy: all of these are tools she employs in the service of creating her distinctive – and distinctly weird – comic universe." "Like a holiday camp run by clowns and deviants... there's plenty of fun to be had"
"Burn is so adorable that both the men and the women in the audience fall in love with her. A natural with physical comedy... and her writing reveals some absolute gems. Bribe or blag your way into the H Club post- haste"